Many thanks to our wonderful customers for raising over $400 for the Community Foundation at White-Wilson by participating in our Sew Pink raffle! The Foundation will use the funds to help disadvantaged women in need of mammograms. What great support we had for this important cause! The lucky winner was Maria Smith...Congrats, Maria! 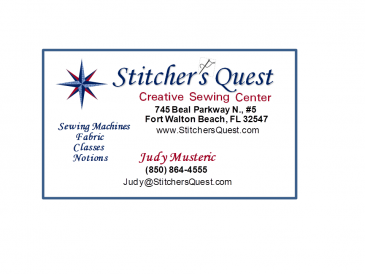 Stitcher's Quest has online shopping available for embroidery designs at Embroidery Design Studio. Just click on the butterfly when you visit our website or click here to open your account. Did you know? 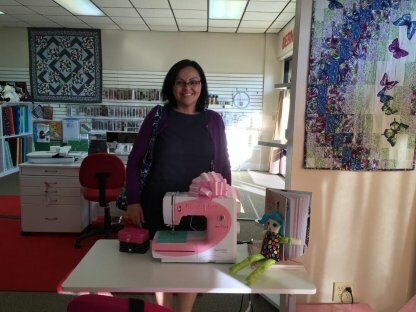 Class registrants receive a 10% discount on any supplies purchased for an upcoming class and on the day of class for additional fabric, thread, and stabilizers. Fashion Wine Tote - Is wine on your giving list? Make it a memorable presentation with this creative Wine Tote! Amy will show you how easy it is to assemble this tote. This is also a great project for embellishment - pick up your supplies early so you can have your special touches ready by class day! We had lots of fun with this in October and have another class planned for January! $26 plus supplies. A two-part class to learn the basics of paper piecing with template layout sheets - Let us know you want this class so we can get dates on the calendar. This is a 10-hour class and will require homework - we will schedule two sessions spaced 2 weeks apart. $52 plus supplies. This class will be scheduled soon, call to be put on our contact list. Free Webinar - Join us for a beginning DesignWorks Software lesson and learn to change simple graphic files and embroidery designs to create PaintWork, CutWork, or CrystalWork designs. Learn how easy it is to personalize your projects with these fun techniques! Tuesday, November 17, 10:00.